Completely romantic furnished detached house suitable for up to 5 people and very cozy. 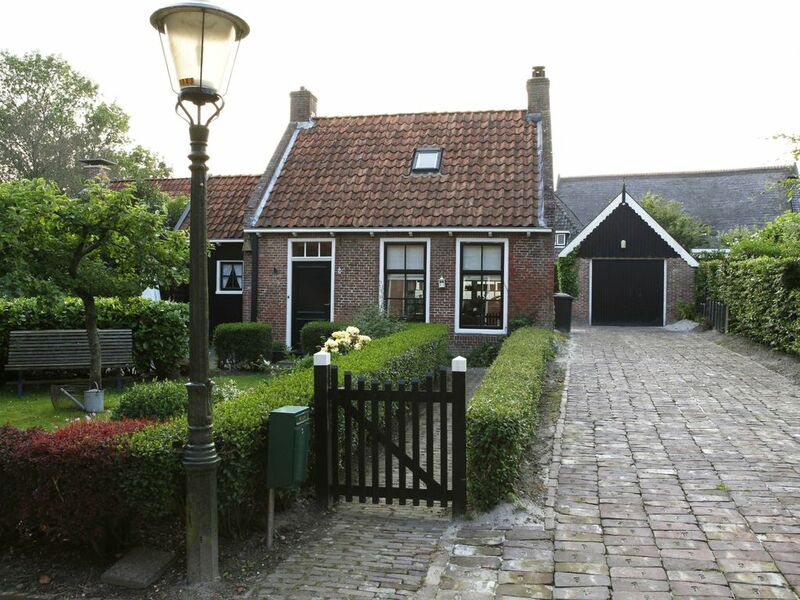 The terphuisje is in the middle of our village in a quiet location with the playground for children around the corner. Because there is only destination traffic is very child-friendly. For those who have difficulty with climbing stairs, this cottage is ideal because the bathroom, the toilet and the two person bedroom are downstairs. In the village there is an eatery and in the nearby Dokkum there are many shops and restaurants. We rent 2 detached houses and 2 apartments, all self-sufficient. Also bicycle and boat rental. Check our website for more info, rates and availability or call us for free information. The departure ports to the Wadden Islands (20 minutes drive) from Ee are very popular for a day out. The crossing over the Wadden Sea to both islands is 45 minutes and with a bit of luck the seals swim with you. Ameland and Schiermonnikoog are ideal for a day out for cycling, going to the beach and spotting seals. Very popular with birdwatchers and nature walks. In the villages on the island it is wonderful to rest on a terrace and enjoy culinary in the many restaurants. On a bike along a beautiful route along the water to Dokkum where many eateries, cafes, shops and attractions are. This historic city is worth a visit with a city walk on the fortress. In Dokkum are beautiful museums and a cruise through the canals is a must. Also very suitable to explore the city with the canoe. From Ee the beach of Lauwersoog and Oostmahorn is ideal to go with children. The Lauwersmeer is perfect for swimming, surfing, sailing or renting a motor boat, but of course you can also fish. On the other side of the dike (the Wadden Sea)) kyte surfing is done. In the port of Lauwersoog the fish is brought in by the local fishermen and you can order a delicious fresh fish meal for little money. Around the village of Ee there are several small villages and cities to visit, of course the eleven cities tour is very popular. By car you can visit the 11 Frisian cities that each have a unique character, with historic buildings and canals. In these cities you can visit many famous museums and popular tourist attractions. and aqua zoo park nearby. It is very popular with children to make a small mudflat with a guide and experience nature on the mudflats and small shellfish e. d. to search. If necessary, make a trip with a horse and cart and afterwards make it a delicious meal with accompaniment. But also for adults there are several mud walks organized. Ee lies exactly between Groningen and Leeuwarden and both at a distance of 30 minutes. Ideal for shop lovers, these cities have various unique shops and beautiful markets. Museums, exhibitions and exhibitions are also widely available. Also for the outgoing public with cinemas, concert halls and theater. Nearby airport is Eelde [45 minutes drive] and Schiphol Amsterdam [2 hours drive] from where public transport to the north is well organized. By train to Leeuwarden and Buitenpost and then another 15 minutes by bus. Beautiful walking / cycling area with lots of nature, national park at a distance of 5 km and the islands of Ameland and Schiermonnikoog at a distance of 20 minutes. Within cycling distance of the historic town of Dokkum where many nice restaurants, but also nice shops, museums etc. Also nice to rent a boat with us and sail to Dokkum. The big cities of Leeuwarden and Groningen are also close (32 km) where much can be seen and experienced. We have 2 apartments and 2 detached houses for rent but also bicycles and a sloop. We respect the privacy of our guests but are always available for questions. We also live in this beautiful mound village and also run a home store. An eatery is present but a supermarket is not available, you can buy the groceries in a nearby village. Wadlopen is very nice, we are close to the coast and to the Lauwersmeer where there is a lovely beach and many water sports possibilities. Authentic villages with very friendly residents. Das Haus ist alt, typisch niederländischer Baustil halt. Sehr liebevoll eingerichtet, es fehlte an keinen Dingen des täglichen Lebens. Sehr nette und zuvorkommende Vermieterin, hier nochmal ein dickes Lob. Das Haus liegt optimal für Ausflüger in die nähere Umgebung. De ontvangst was hartelijk en na een korte rondleiding kwamen we tot de conclusie dat het huisje heel compleet was. Servies, bestek, handdoeken, bedlinnen, je greep nooit mis. Zelfs koffie, filterzakjes, kruiden en broodbeleg was aanwezig. Ook de lekkere appelflappen maakten dat we ons direct welkom en thuis voelde. Mooie omgeving, veel gezien. Gefietst, gewandeld en er achter gekomen dat Friezen heel gastvrij zijn. Het huisje -en ook de andere accomodaties van deze verhuurder- zijn meer dan aan te bevelen en we komen ook zeker terug!! Wij hebben hier een heerlijke tijd gehad met 4 vriendinnen. Alles wat je maar kan wensen is aanwezig in het huisje, en Adrie de gastvrouw heeft er alles aan gedaan om te zorgen dat gasten zich thuis voelen en heeft ons een paar goeie tips gegeven voor activiteiten in de buurt. Het wadlopen is zeker een aanrader! Wat fijn dat jullie verblijf in het terphuisje van de gastenkamer als positief hebben ervaren. Jullie waren erg spontaan en ook erg fijn dat het vakantiehuisje zo netjes is achter gelaten. Dank jullie wel daarvoor. We hebben een heerlijke tijd gehad in het terphuisje. Adrie heeft voor onze zoon van 1,5 geregeld dat een campingbed en speelgoed klaar stond. Ook fijn dat er een mogelijkheid van oppas was!